Dragutin Dimitrijevic (also known as Apis�; August 17, 1876, Belgrade - June 27, 1917) was a Serbian soldier and leader of the Black Hand group which assassinated Franz Ferdinand, Archduke of Austria in 1914. The latter triggered the July Crisis which led to the outbreak of World War I.
Dragutin Dimitrijevic was born in Belgrade in 1876. At sixteen Dimitrijevic went to the Belgrade Military Academy. A brilliant student, Dimitrijevic was recruited into the General Staff of the Serbian Army immediately after his graduation. Captain Dimitrijevic and a group of junior officers planned the assassination of the autocratic and unpopular king of Serbia. On 11 June 1903, the group stormed the royal palace and killed both King Alexander and his wife Queen Draga. During the attack Dimitrijevic was badly wounded, and, although he eventually recovered, the three bullets from the encounter were never removed from his body. The Serbian parliament described Dimitrijevic as "the saviour of the fatherland" and he was appointed Professor of Tactics at the Military Academy. He visited Germany and Russia where he studied the latest military ideas. During the Balkan Wars (1912-13), Dimitrijevic's military planning helped the Serbian Army achieve several important victories. Picture - Dragutin Dimitrijevic Apis (right) and his associates. Dimitrijevic's main concern was the liberation of all "South Slavs," especially Serbs, from Austria-Hungary. Although Serbia was already an independent country, many Serbs in Bosnia and Croatia were still under Austro-Hungarian rule. Dimitrijevic, who used the codename Apis, became leader of the secret Black Hand group. In 1911 Dimitrijevic organised an attempt to assassinate Emperor Franz Josef. When this failed, Dimitrijevic turned his attention to the heir to the throne, Archduke Franz Ferdinand. Dimitrijevic was concerned about Ferdinand's plans to grant concessions to the South Slavs, fearing that, if this happened, a unified Serbian state would be more difficult to achieve. When Dimitrijevic heard that Archduke Franz Ferdinand was planning to visit Sarajevo in June 1914, he sent three members of the Young Bosnia group, Gavrilo Princip, Nedeljko Čabrinovic, Trifko Grabež and four others from Serbia to assassinate him. Unknown to Dimitrijevic, Major Vojislav Tankosic was informing Nikola Pa�ic, the prime minister of Serbia about the plot. Although Pa�ic supported the main objectives of the Black Hand group, he did not want the assassination to take place, as he feared it would lead to a war with Austria-Hungary. He therefore gave instructions for Gavrilo Princip, Nedeljko Čabrinovic and Trifko Grabež to be arrested when they attempted to leave the country. However, his orders were not implemented, and the three men arrived in Bosnia-Herzegovina, where they joined forces with fellow conspirators, Muhamed Mehmedba�ic, Danilo Ilic, Vaso Čubrilovic, Cvjetko Popovic, Mi�ko Jovanovic and Veljko Čubrilovic. After the assassination of Archduke Franz Ferdinand on June 28, 1914, several members of the Black Hand group, under interrogation by the Austrian authorities, claimed that three men from Serbia (Dimitrijevic, Milan Ciganovic, and Major Voja Tankosic) had organised the plot. On July 23, 1914, the Austro-Hungarian government sent its July Ultimatum to the Serbian government with a lengthy list of ten different demands. In his response on July 25, 1914, Nikola Pa�ic, the Serbian prime minister, accepted all the points of the ultimatum except point #6, demanding Serbia to allow an Austrian delegation to participate in a criminal investigation against those participants in the conspiracy that were present in Serbia. Three days later the Austro-Hungarian Empire declared war on Serbia. Nikola Pa�ic decided to get rid of the most prominent members of the Black Hand movement, by then officially disbanded. 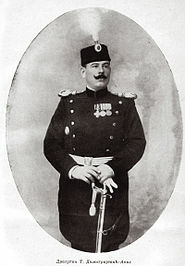 Dimitrijevic and several of his military colleagues were arrested and tried on false charges blaming them with attempted assassination of regent Aleksandar I Karadjordjevic. On May 23, 1917, following the so-called Salonika Trial, Dimitrijevic was found guilty of treason and sentenced to death. A month later, on June 11, 24 or 27, he was executed by firing squad. In 1953, Dimitrijevic and his co-defendants were all rehabilitated by the Supreme Court of Serbia and found not guilty, because there was no proof for their alleged participation in the assassination plot. Milan Živanovic: Solunski proces 1917. Savremena administracija, Beograd 1955. Valentin Pikul: "To Have Honor" In this book the main character was friends with Apis and helped in the murder of Aleksandar Obrenovic and his wife in 1903.